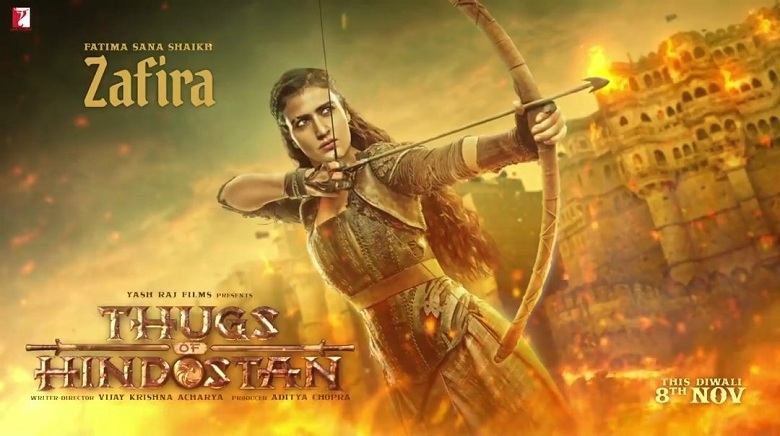 Here we present the first look of Fatima Sana Shaikh as 'Zafira' from the movie Thugs of Hindostan. Fatima is playing one of the pivotal roles in the film. Her character is Zafira. Zafira is fiery and stunning. She is an extremely talented fighter and specialises in combat by bow and arrow. Zafira has perfect accuracy and she doesn’t miss a target, ever. Already first look of Amitabh Bachchan and now Fatima is out. We expect Katrina Kaif first look to get released tomorrow and finally Aamir Khan's first look on 21st September, 2018. Film trailer will be released on 27th September, 2018 that is 9 days from today. TOH is easily the biggest and costliest Bollywood movie till date. Film is getting released on 8th November, 2018 and will take earth shattering start in ticket counters. Stunning. The way it is presented if the movie is that good all the records will be rewritten. Par poster dekh ke aisa lag Raha hai 600cr bhi kar sakti hai Hindi mein! Let's see who collects more- TOH or Zero .